This anti-gravity inversion hang up boots are designed for comfortable contoured padding for extra support with material of fam with steel buckle package. Make sure boot hooks are securely fastened to bar. Ensure tight yet comfortable fit around your ankles. Consult a doctor for persistent back pain before usage attaches to almost any chin-up bar. This boots are specially concern about the stable, comfortable when customer use. Material: Foam with steel buckle package. 1 Pair x Boots (not including the stand). 【PREMIUM QUA:LTIY DESIGN】300 lb weight capacity; Comfortable padded sides for contoured fit around your ankles; Sturdy hooks fit over bars and buckles close the pads. Buckle is made of Steel, durable and long to use. This boots are specially concern about the stable, comfortable when customer use. 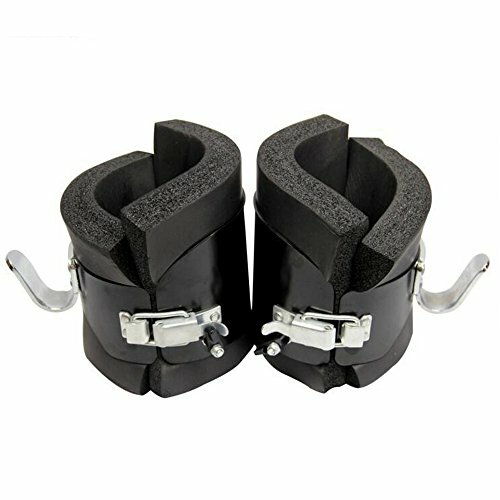 【RELIEVE BACK PAIN AND MUSCLE】Tightness hang upside down with this hanging pull up boots to help reduce back pain, muscle tightness, and spasms and helps you to stretch neck, shoulder muscles and back ,relieves fatigue from muscle compression due to cycling, jogging, and other exercises. 【OUR THIS BOOT'S COMPATIBILITY】Hooks are for use with standard 1-1 1/2" diameter chin-up bars; People with thinner legs should wear boots or use extra padding for secure fit. Dimensions: Inside diameter - 3 7/8", Outside diameter - 6 1/2", Length: 7 1/4", Padding: 1 1/4" thick. 【PLEASE CHECK BEFORE USING】Make sure boot hooks are securely fastened to bar; Ensure tight yet comfortable fit around your ankles; 30 seconds to 2-minute intervals of inversion at a time; Consult a doctor for persistent back pain before usage.